Samsung has always taken the lead with its Galaxy series of smartphones that run on Android operating system and has come out with some new and unique features with every device that they launch. Recently they launched their flagship smartphone, Samsung Galaxy S5 and now there are talks that they are working on launching an upgraded version of Galaxy S5 which will known as Samsung Galaxy S5 Prime or it will names as Samsung Galaxy F.
Since HTC has launched the Desire 816 and the HTC One M8 and Motorola leading with its Moto X and Moto G smartphones, Samsung has come up with an idea to re-launch their best smartphone with upgraded features and if the rumors are believed to be true, then you could expect to see the Samsung Galaxy F hitting the stores somewhere in September. 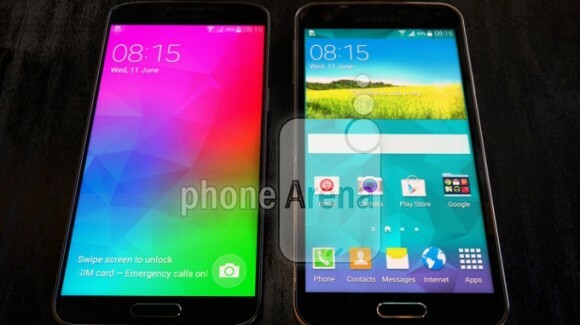 The Samsung Galaxy S5 Prime or Galaxy F has been tipped to come with a 5.2-inch QHD display with a resolution of 2560 x 1440 pixels. The display has to be the best in the market if they want to live up to the hype considering that Samsung Galaxy S5 had the best smartphone screen. One great reason to believe that Galaxy F might house a QHD display is that its rival LG has already been working on releasing its flagship smartphone, LG G3 and it comes with a QHD display. So to keep up with its rivals or leave them behind Samsung Galaxy F should come with the best and the features that none of its competitors are offering. Next big thing that one can expect from Galaxy S5 Prime is that it will come with an all-metal chassis putting it in the league of iPhone 5S. An image posted on Reddit shows the metallic finish on the smartphone. Not just the photo leaked on Reddit, even PhoneArena came up with some photos of Samsung Galaxy S5 Prime saying that it sports the same back as Galaxy S5 but its a metal one. Not only just the image for the smartphone, they even managed to get an image of Samsung Galaxy S5 and Samsung Galaxy S5 Prime (Samsung Galaxy F) side by side. Seeing the image, we can clearly say that there won’t be much difference between the two smartphones and the overall size looks the same. There is no word on the thickness as of yet and it can’t be seen from the image too, but the safest bet would be that the Galaxy F would surely be a little thinner than Galaxy S5. 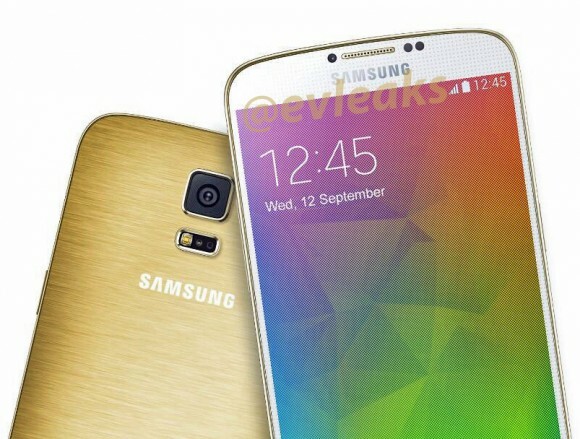 Here’s yet another photo coming from the trusted leaker @evleaks which shows the smartphone in a gold hue. Coming to the processing power of the smartphone we can assume that this one’s going to get an upgrade. Considering that Galaxy S5 was powered by a 2.5 GHz quad-core Snapdragon 801 processor, the Samsung Galaxy F might come with a 2.5 GHz quad-core Snapdragon 805 processor along with an improved 3 GB RAM and Adreno 420 GPU or an Adreno 405 GPU chip. The smartphone will run on the latest Android 4.4.3 KitKat operating system and would probably come with a better battery, something around 3000 mAh, which would be slightly up from the Galaxy S5. Camera-wise, Samsung Galaxy F is going to house a 16 MP rear camera and a 2 MP front camera along with 4K video recording and all the features and specs that you expect from Samsung’s high-end smartphones. As it is rumored to be an upgraded version of Galaxy S5, the Samsung Galaxy S5 Prime or the Samsung Galaxy F, whatever you want to call it, is going to be priced a little higher and will surely leave a hole in your pocket. The price has not yet been out, but be ready to shell out a lot more if you want this baby in your hands. The release date has been tipped to be around September by @evleaks, so you can expect the smartphone to hit the market most probably in the 4th quarter of the year. I only hope that it would be worth the wait. That’s all the news that we could gather in a single post. As new rumors and features are leaked online or if the official announcement is made, we will make sure that it reaches you. So be sure to share the post with your friends and keep visiting for more info on Samsung Galaxy F or Galaxy S5 Prime!